The yacht’s eco credentials continue below decks with a reversible heating/air conditioning Webasto pump, that will heat and cool the yacht using minimal power. Spirit Yachts has begun construction of its first electric yacht, a 13.4m vessel due to launch early 2020. 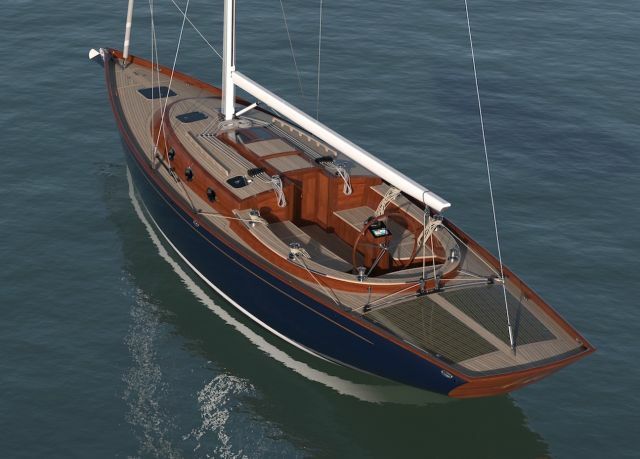 The Spirit 44E, has two solar panels integrated into her deck, colour matched to the teak. These will charge OceanVolt 48VDC 30.4kWh batteries (made up of 48 1.9kWh batteries), which will power an Oceanvolt SD15 electric drive. 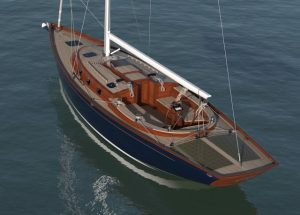 “From afar, the Spirit 44E will look like any other Spirit sailing yacht,” said Spirit Yachts head designer Sean McMillan. “Low freeboards, long overhangs, flush decks and the timeless beauty of quality wooden craftsmanship. Hydrogeneration via the propeller is used to regenerate the batteries while sailing, calculated at 1.5kW while sailing at five knots. In addition, Spirit Yachts is working with OneSails GBR (East) to develop a solar solution for the Spirit 44E’s sail wardrobe. “We are exploring the use of the very latest ‘thin cell’ PV panels with the intention of utilising the yacht’s 4T Forte sails and covers as sources of electrical generation,” said OneSails John Pareker. The sailcloth can also be recycled. All lighting is LED and a Webasto 4.2gallon 115v/750W heater will provide hot water. There are no hydrocarbons onboard and any cooking will be done on a spirit stove. “With the 44E, we are taking the learnings from the 34m Spirit 111 and applying the same principles to a smaller yacht,” said Spirit Yachts MD Nigel Stuart.